Correct treatment of industrial cooling systems protects against deposits and corrosion and keeps the microbiological growth under control. In cooling systems – both open and closed systems used for cooling process equipment and other industrial production – there are high demands for the chemical and microbiological water quality. Because if the cooling does not work, it could damage the production – for example, in the food and pharmaceutical industries, where unstable biological and chemical processes will have a significant impact on the company’s profit. The cooling effect of a system depends strongly on the insulating effect on the surfaces where the heat transfer occurs. Insulation is formed by the materials in the system, but also largely by deposits (scales/salts and corrosion products) and biofilm. In cooling towers it is also important to keep the packing material in the tower free from deposits, which are typically caused by biofilm. Biofilm captures and builds deposits of particles from the water and from the air that is sucked through the tower. Norlex Chemicals’ cooling water treatment programmes combine effective inhibitors and biocides with data analysis, monitoring and services that together ensure that the entire system is effectively protected against corrosion, deposits, biological growth and other potential problems. All this is achieved by selecting the right combination of inhibitors and biocides based on analyses of the available water resource. Generally speaking, the programme may either be based on a near-neutral pH (about 7.0–7.4) or a weak alkaline pH (about 7.8–8.2) in the system. 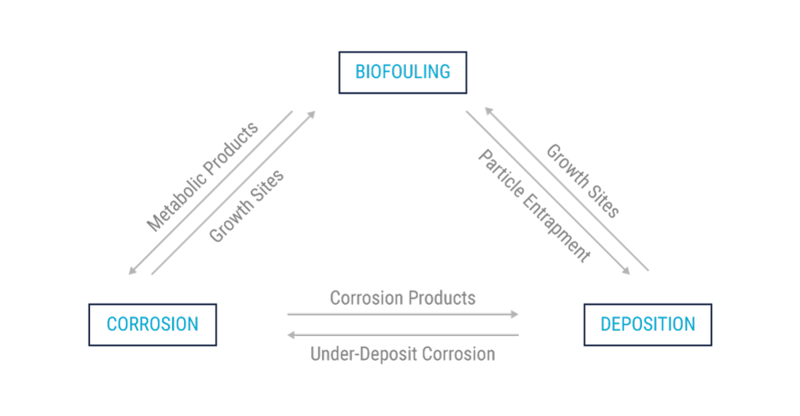 Programmes based on a near-neutral pH will be more intensive protection against corrosion and will be able to use oxidising (halogen-based) biocides. Programmes that, on the other hand, are based on a weak alkaline pH will be more intensive protection against scales and will generally be using non-oxidising biocides. Programme selection depends on water quality, system structure and other factors. Both approaches can be effective, but requires a different approach. We provide individually tailored service and support that takes into account the special operating conditions of your industry. We serve you all the way from testing, start-up and operation to subsequent constructive feedback and servicing.